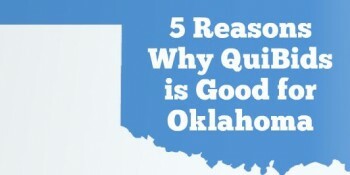 Home / 5 reasons why QuiBids is good for Oklahoma! QuiBids is Oklahoma City-grown and Oklahoma City-proud! All five members of our executive team (I like to think of them as our founding fathers even though they’re all in their late twenties and early thirties) were either born or raised in the OKC metro area, which is why they chose to headquarter QuiBids in Oklahoma when they established it in 2009. Though QuiBids’ first office was technically CEO Matt Beckham’s apartment, it’s now located in the Valliance Bank Tower, near Oklahoma City’s thriving 50 Penn/Belle Isle district. Of course thriving local businesses are good for a city’s (and state’s) economy, but QuiBids’ Oklahoma contributions can’t all be measured in dollars and cents. Our operation began with a modest six folks and now employs about 150 well-educated people with high-quality, benefits-paying jobs. About 85% of QuiBids employees hold at least a bachelor’s degree, and many of them began working for the company on a part-time basis while still in college. As QuiBids expanded over the last three years (and continues to grow now) we’ve been able to hire these young part-timers into salaried, full-time positions right out of school, keeping a host of bright, young men and women from carrying their Oklahoma educations off to the benefit of other states. And with all we’ve received, we find great joy in giving back to Oklahoma. QuiBids partners with a handful of charities, most of them local or localized chapters of a larger organization. We helped build and stock a “QuiBids house” with Habitat for Humanity and recently sponsored grocery shopping trips for several underprivileged families in partnership with the Regional Food Bank of Oklahoma. 1. QuiBids’ business opens previously nonexistent distribution channels that direct revenue into Oklahoma from other states and countries. 2. In nearly three years of operation, more than 90% of our hires came from within the state. 3. Though we do business internationally, we work with local charities like the Regional Food Bank of Oklahoma and the Oklahoma Children’s Hospital. See our blog’s Charity category for more information about that! 4. QuiBids employs about 150 well-educated people with high-quality jobs. About 85% of them hold a bachelor’s degree, and most obtained them at universities in Oklahoma. 5. Our employees are active members and leaders of lots of organizations that promote in-state business, including the Oklahoma Business Roundtable, Young President’s Organization, and Leadership Oklahoma City, as well as various trade groups like PRSA, OCHRS, and OSCPA.